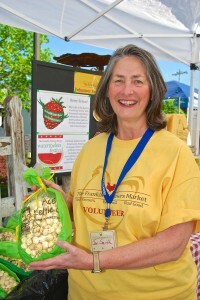 Volunteers are what keeps the Franklin Farmers Market growing! 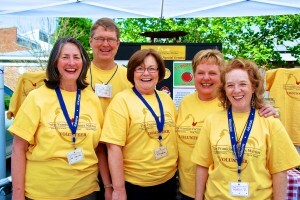 We appreciate our volunteers and are always looking for new market enthusiasts. If you believe in local sustainable food options, and/or supporting the next generation of Tennessee farms, we’d love to have your help. From helping market vendors locate their booth space in the early hours of Saturday morning, to answering customer questions at the information booth, to slicing strawberries and or tomatoes for one of our six market special events. 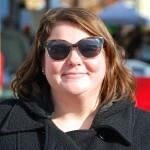 I am a market volunteer at the Franklin Farmers Market for a variety of reasons. I love fresh veggies that are locally grown (especially tomatoes, arugula, berries and peaches) and using those products as I prepare meals for my husband and friends. 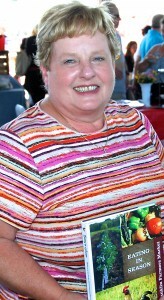 It was that love of cooking that prompted me to volunteer to work with the FFM to develop Eating in Season, the Franklin Farmers Market Cookbook. I also enjoy talking “recipes” with other customers when I help sell the Cookbook at the Market and educating novice cooks to try something new. I have found a community of like-minded cooking friends (regular customers and other volunteers) through being a farmers market volunteer. As much as I love and come to get the food I find at the Market, it’s the people; other customers, volunteers, farmers and vendors, that keep me coming every week. The Franklin Farmers Market has become a very pleasant part of my life and volunteering is part of what makes me feel like I am part of the Market family. Volunteering at the Franklin Farmer’s market is a unique experience and has been a wonderful opportunity for me to meet some of Franklin’s finest folks! We moved to Franklin three years ago when we retired. It was my turn to give back to the community in which we plan to live for many years. Volunteering at the Franklin Farmer’s Market gives me an opportunity to help our farmers and vendors keep their businesses prospering. I also get to discuss and learn about organic foods that are grown in our area. Helping out on Saturdays has also given me a chance to meet neighbors as well as promoting Franklin to visitors! The added benefit of volunteering at the FFM is trying all the healthy foods available from our farmers. 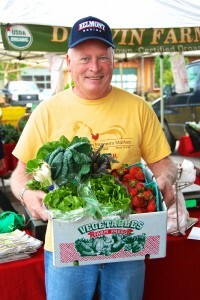 There is no better way to feel proud of your community than to meet and greet folks and promote our wonderful market! A number of years ago, a friend and fellow East Tennessean told me, “You’ve got to go down to the Franklin Farmers Market.” I politely ignored her. We were living in Ashland City at the time and a trek to Franklin was a major commitment. Then, we moved to south Davidson County where we found ourselves exactly in-between downtown Nashville and downtown Franklin, so I finally went. It was a revelation. Always an avid cook, I found myself marveling over the variety of vegetables, the intense flavor and aroma of our local strawberries, and the excellent flavor of a local, pasture-raised chicken! I signed up for the e-newsletter that first day. I began to think back to my grandfather and his cousin who between them produced a large percentage of the food I ate growing up, in particular, home-grown spring, summer and fall vegetables. Because of this, things like Swiss chard, bulbous Bradley tomatoes, and alien-looking winter squashes were not at all foreign to me. I was thrilled to have them back in my life via FFM. At this same time, I read Barbara Kingsolver’s book “Animal, Vegetable, Miracle” and began to ponder issues surrounding our current food system: the good; the bad, and the ugly. I was grateful to be able to contribute in my own small way to the local food economy and to the livelihood of folks attempting to keep small-scale farming alive as a FFM customer. But, I also knew I wanted to be involved in more than this small way and so I signed up to volunteer. I’m coming up on my fifth season as a volunteer, now. And still, I can’t think of a more enjoyable way to spend a Saturday morning, communing with FFM customers and vendors, and of course, fellow volunteers, who are one of the coolest groups of people I know!! 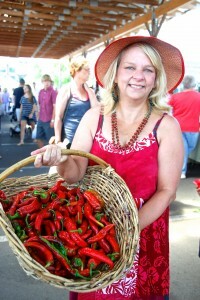 I read an article about the Franklin Farmers Market in the Review Appeal newspaper by Carole Robinson around 2002. The article discussed CSAs (Community Supported Agriculture), and I was aware of them in other parts of our country, just not here. I called Cindy and Hank Delvin, drove to their farm in Nolensville, and picked up my first CSA share! I began attending the Franklin Farmers Market from that point on. It has been exciting to meet all the farmers and see the market grow. My parents were raised on farms in Middle Tennessee, and we had a garden and planted fruit trees to enjoy each year. My first paid job was picking up walnuts at my grandmother’s farm to sell at either the Co-op or at various farmers markets. My parents ensured that we understood how to grow food and the rewards of eating fresh food picked the very same day! I have become a volunteer for the Franklin Farmers Market during the last few years because I am passionate about sharing the same things I grew up with to both children and adults. Attending the Franklin Farmers Market and seeing all the engaged people makes me want to stay all day! There are so many opportunities to make a difference in our community and I love to dream of the possibilities! I consider it both a gift and an honor to volunteer for the Franklin Farmers Market! I began volunteering at the Franklin Farmers Market as a way of showing my support to local farms, artisans, and small businesses. I think accessibility to local food suppliers is so important to the overall health and wellness of any community. Because the market is able to provide that connection between local farms and the community, I believe it is an incredibly valuable public service, and I wanted to be a part of that. I continue to volunteer not only because I believe in this service the market provides, but also because of the wonderful people I have met and friendships I’ve established. As a market volunteer, and customer, I love showing up to smiling, friendly faces that I trust to provide me with the highest quality products. If you want to meet some amazing people, while also helping to grow and serve your local community, I suggest checking out volunteer opportunities with the Franklin Farmers Market. For many years, I loved going to the Farmer’s Market in the locations where I lived. Before we were relocated to Tennessee, I was a regular customer at the markets located in Olympia, Washington and Eugene, Oregon. Pikes Place Market in Seattle, Washington is the largest market in Washington state and we had the opportunity to visit it regularly. 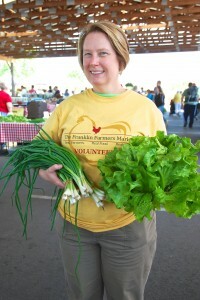 When I retired, volunteering for the Franklin Farmer’s Market was tops on my list of post-work opportunities. I’ve been a volunteer for about six years and I can’t think of a better way to spend my Saturdays. The vendors and the visitors are all very friendly and conversational. Since I do all the cooking at home for my wife and daughter, I can’t think of a better place to spend my Saturdays talking to the vendors and purchasing fresh Tennessee vegetables for our dinner table. All I can say is volunteering for the Franklin Farmer’s Market is fun and relaxing. After spending 30 years in a cubicle, being in the fresh air and talking to friendly customers is the best. I can’t think of anything better than to spend every Saturday at the Franklin Farmer’s Market.